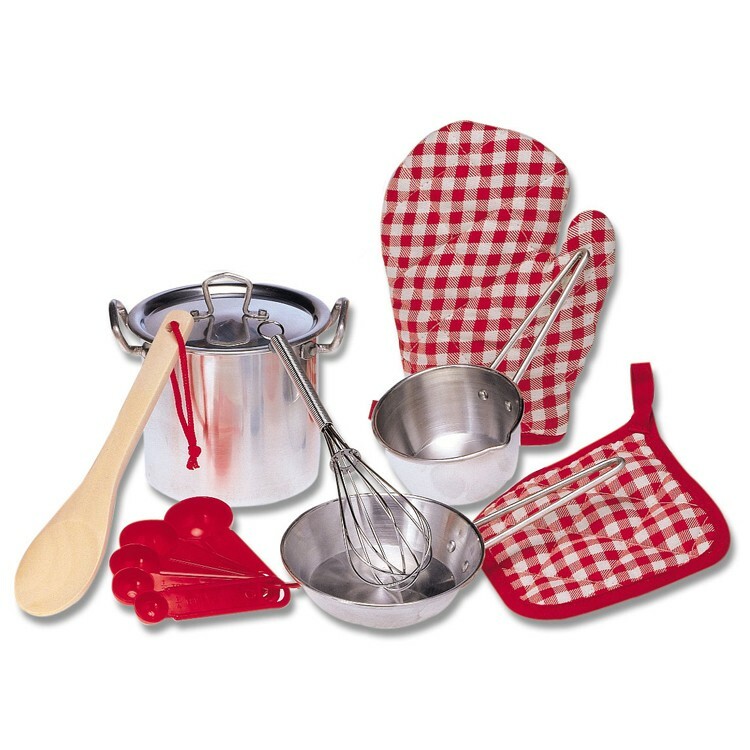 Lets play cooking with this perfect Completer Cook Set for young chefs! No play kitchen is complete without a good pots & pans set! Give your young chef this Alex Toys' award-winning Completer Cook 9 pc Kids Cookware Playset to inspire pretend cooking for hours! 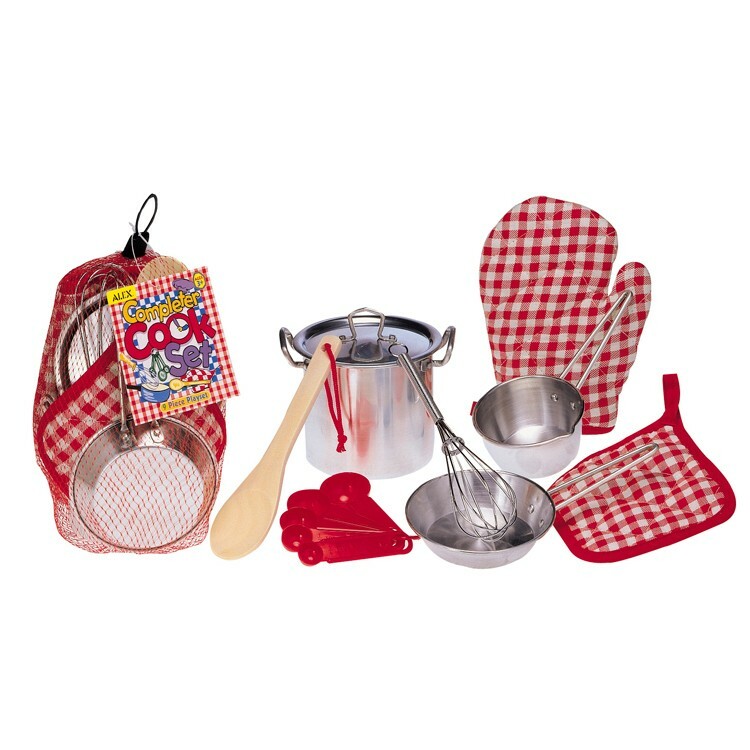 This kids cookware set from Educational Toys Planet contains a sauce pan, 4.5-inch pot with lid, saute pan, oven mitt, pot holder, whisk, measuring spoon set, and wooden spoon. 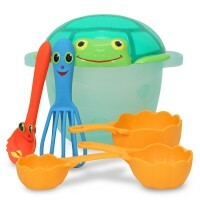 Completer Cook 9 pc Kids Cookware Playset is made with Alex' famous toy quality to last for years. 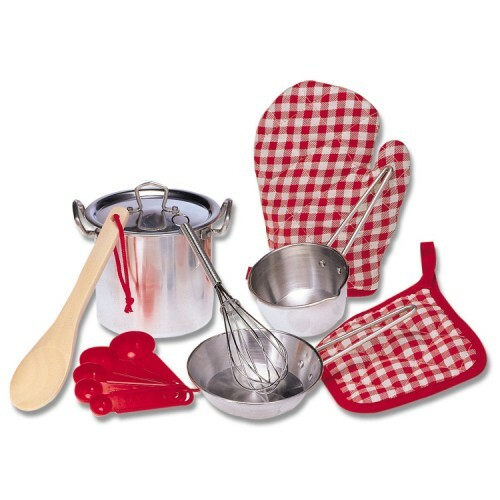 This kids pots & pans set is also a perfect gift addition to any children play kitchen. 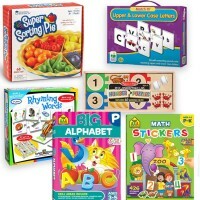 Dimensions of package 6" x 6" x 7.5"
Write your own review of Completer Cook 9 pc Kids Cookware Playset. 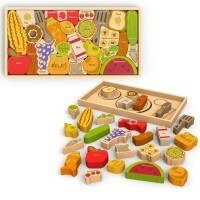 Rating: 5 Perfect for toy kitchen by By A customer My son loves these and uses them with his kidcraft retro kitchen! 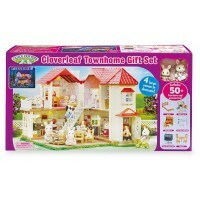 Rating: 5 Value by By A customer Bought this as a gift and my friend's daughter was in LOVE with this set! Now she can play cook just like mommy. Rating: 5 Five Stars by By A customer Granddaughter loved it! Great product. Rating: 5 Cutest oven mitt ever by By A customer My grandson started cooking with this as soon as he opened it at his 2 year birthday party. Big hit at home & at daycare. Rating: 4 nice but to small by By A customer Its nice but to small anyway the material is good and long durability. My son love anyway. Nice toy but small. 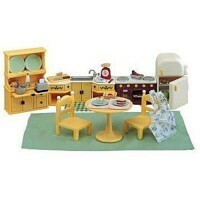 Rating: 5 An amazing set for the kid who loves to pretend cook! 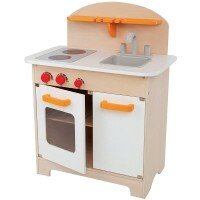 by By A customer We got this for my daughter for Christmas, and she was so excited to get her very own set of cooking gear! It has a potholder and an oven mitt, a pot and pan that look just like ours, a real wooden spoon (looks just like ones we use! ), and a real whisk. She had a blast "cooking" us up some breakfast as I made scrambled eggs and bacon. Lol! Even better, she carefully watched, then emulated, my every motion. 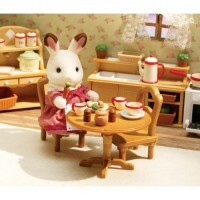 Beyond adorable, and quality toys! 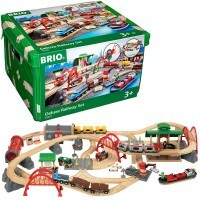 ALEX brand toys are consistently tough, good quality, and as close to real-life as possible- one of my favorite toy brands! Rating: 5 Cute little set by By A customer This is such a cute little set. I love it because my son loves taking my oven mitts but now he has his own! 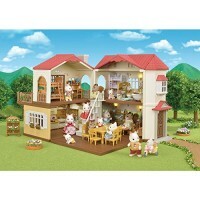 Goes great with the Alex Toys kitchen I bought him. Rating: 4 For the Alex Cooktop Play Stove by By A customer This is the set pictured with the Alex Cooktop Play Stove. Nice quality and will problaby outlive the stove. The oven Mitch and pot holder are perfect for the small hands that play with this. 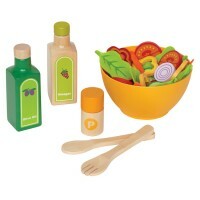 Rating: 5 PERFECT by By A customer MINI KITCHEN ITEMS CAME AS DESCRIBED.MY KIDS LOVE THE, WE GOT IT TO GO WITH THE MINI KITCHEN FROM ALEX TOYS.